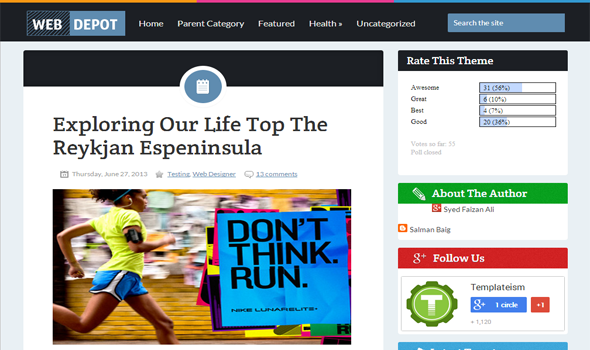 The WebDepot Blogger Template is a combination of different color schemes which makes it look unique. Colorful Sidebar Title: Unlike other blogger templates, we have first time use a new technique to display colorful sidebar titles along with a smallish icon. For example, for Facebook Widget, we have used Dark blue sidebar title along with a small Icon “F” Logo representing Facebook. SEO Friendly: Like our most of the theme, this is also SEO Friendly. It is pre-optimized for on-page SEO. Including heading tags, Meta tags, Keywords and in-depth optimizing things. More importantly, the speed of this it significantly faster than the majority of other heavy-duty templates. More Features: Drop Down Menu, 4 column footers, multi-color scheme, threaded commenting system, 2 column templates, and much more. We hope this theme has helped you in renovating your blog with awesomeness. Let us know what you think about this multi-color theme? Suggests and bugs would be more than welcomed. On a second note, take a few moments to sign up for our newsletter to keep on enjoying our latest theme release. Use the Subscription widget located in the sidebar, just round the corner!